Astrophotographer John Chumack took this image of edge-on spiral galaxy NGC 891 (also known as Caldwell 23), after 130 minutes of exposure on Sept. 7 from his observatories at Yellow Springs Research Station in Yellow Springs, Ohio. He took this shot with a QHY8 Cooled Color Astronomical CCD Camera and a homemade 16” diameter Fork Mounted Newtonian Scope. What might appear to some like a flying saucer careening through deep space is actually a photo of a majestic spiral galaxy taken by a veteran astrophotographer. The picture of the galaxy NGC 891, taken by photographer John Chumack, reveals what our host galaxy, the Milky Way might look like if seen edge-on from millions of light-years away. "We see our Milky Way stretch across the night sky horizon to horizon every summer," Chumack told SPACE.com via email. "Now, if we were to back away from the Milky Way by about 30 million light-years, our Milky Way would look very much as NGC 891 does in this photo." A light-year is the distance light travels in one year, about 6 trillion miles (10 trillion kilometers). 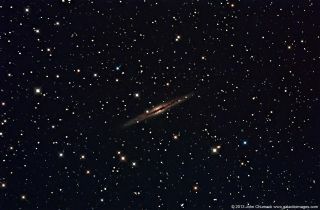 NGC 891, also called Caldwell 23, is located in the constellation Andromeda roughly 30 million light-years away. Both NGC 891 and the Milky Way are considered similar in terms of luminosity and size. Chumack captured the image over 130 minutes of exposure on Sept. 7 from his observatories at Yellow Springs Research Station in Yellow Springs, Ohio. He used a QHY8 Cooled Color Astronomical CCD Camera and a homemade 16" diameter Fork Mounted Newtonian Scope to take the photo.